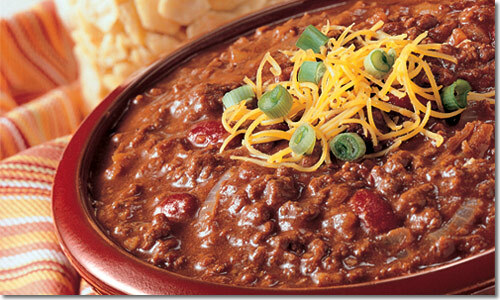 Although yesterday felt like the hottest day of the year so far, I felt like eating some chili today. It’s great in big batches, it’s filling and it goes great over rice. Still, I’m mostly looking forward to the leftovers – it’s been a while since I had a chili cheese hot dog, so I thought I should remedy that. I began by putting the chopped pieces of bacon into a Dutch oven, and then adding garlic and onions until they were browned. Next, I added the ground turkey, cooked it a little, and then the ground beef. After the meat was browned, I added the bell peppers, kidney beans and tomatoes, topping it off with a bottle of Bud Light. Sorry to not be drinking it, but it’s going to a good cause. Next, I added a bag of chili spices (I had a pre-made packet, which includes some corn meal I believe, from a county fair that one of my roommates went to, but it wasn’t enough), more spices and some barbecue sauce (I didn’t have any, so I used some ketchup instead). As an experiment, I also added some honey (for sweetness) and some red wine vinegar (for tangy-ness). After that, I just simmered it until most of the liquid was gone, and then served over rice. Did I mention I’m looking forward to using the leftovers for chili cheese hot dogs? This entry was posted in American, Main Dish and tagged Groups, Tailgate. Bookmark the permalink.